Filter by Beta Access Standard Account Format Tricentennial Ed. On November 14, 2018, we'll be able to get back into the dreaded wastelands of the Fallout universe with the release of Fallout 76 on PS4, where we'll be able to enjoy a vast and detailed RPG as we're used to in this franchise. Certain details have been revealed, and it has been observed that it will be very focused on the multiplayer game and has enhanced the aspect of survival. Attention: Fallout 76 for PS4 bookings can include access to the closed beta. Pay attention to the details at each of the stores for more information. Don't forget that this product can come in several versions: In physical version, so you will receive at home the box with the product, like any other purchase. or the digital version. 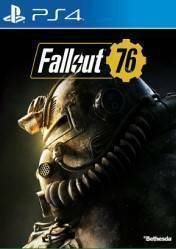 This latest version can be in account format or in code format, which you will need to enter into your Playstation Network account to download Fallout 76 for PS4. Fallout 76 will have missions and history, like previous releases, but will be heavily multiplayer and survival focused, with construction mechanics typical of the genre. We will be progressively updating the information as more data on the next big RPG of Bethesda in E3 2018 becomes available. There are no comments yet about FALLOUT 76. You can be the first one!